I'm not a gardener. Plants only survive and bloom in spite of me. 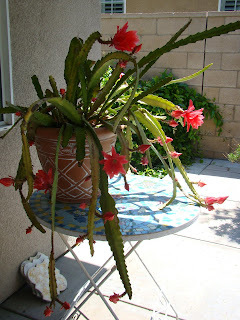 A neighbor gave me a cutting of this cactus 5 years ago and it never flowered that much. It would get water if I remembered but not regularly. This year I transplanted it into a bigger pot and cleaned out the dead stocks and weeds. Like magic, it bloomed! 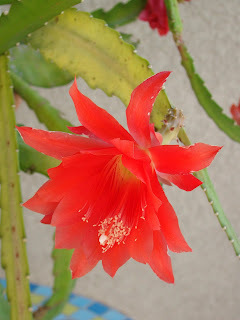 I think it's called Christmas Cactus.